The opening round of the NFL is where most people focus their attention, hence why it was moved to a prime time, national broadcast on a Thursday night, but how team’s draft in the later rounds is of huge importance too. Whether it’s to find a late round gem who performs like a first-round draft pick, or simply adding solid depth to help fill out their roster, there is tremendous value to be found in the later rounds of the NFL draft. With that in mind, here are 10 players who have made an impact despite being drafted in the fifth-to-seventh rounds and a stat from our college data which gave an indication that they could be a success at the next level. The Miami Dolphins traded Ajayi away during the 2017 season, but there is no denying the impact he has made since arriving in the NFL. A workhorse at Boise State, his 349 total touches were the most in college football in 2014 and he averaged 3.55 yards after contact per carry, good for third in his draft class. That’s a stat which has held fairly true in the NFL, as he has averaged 3.3 yards after contact per carry over his three-year career so far. With 113 missed tackles forced on 526 carries over the past two seasons, don’t expect Ajayi to slow down anytime soon. 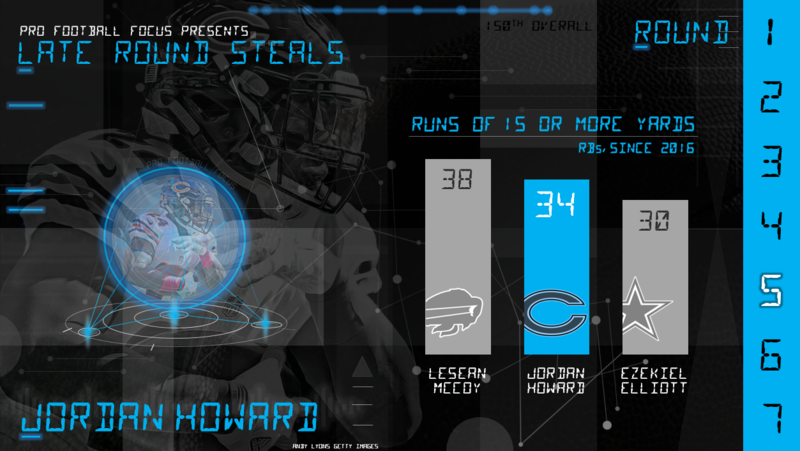 Howard has been a hit since arriving in Chicago and has forced 74 missed tackles on 528 snaps over his first two seasons in the NFL as the Bears lead back. This shouldn’t have come as too much of a shock though, especially when you consider that he produced a higher elusive rating (69.5) than first-round draft pick Ezekiel Elliott (65.7) in his final season in school. Another running back who is now making an impact on a team different to the one that drafted him, Collins surprised a lot of people with the impact he made for the Ravens in 2017. 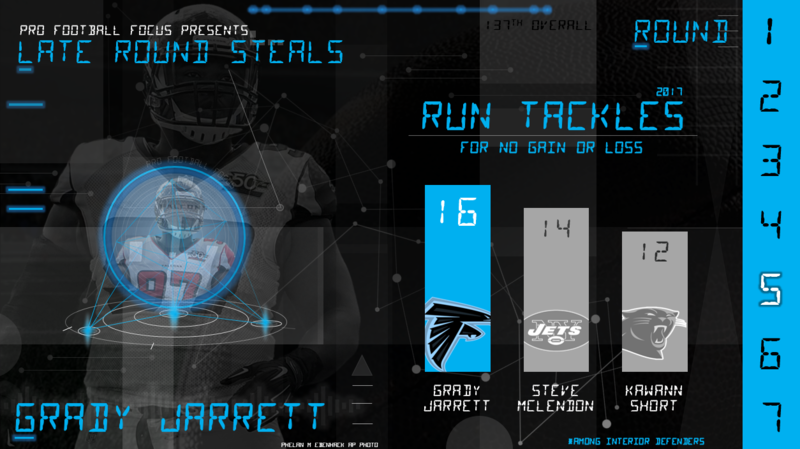 He finished the season with the fourth-highest overall grade and highest rushing grade among running backs in the NFL. Collins didn’t dominate in college, but did produce solid numbers, with an average of 3.2 yards after contact per carry and 97 missed tackles forced over his final two seasons at Arkansas. Diggs has developed into one of the top wide receivers in the NFL and ranked eighth among wide receivers with a PFF grade of 85.4 in 2017. His raw production in his final season at Maryland, 796 receiving yards, didn’t blow anyone away, but when you consider the talent at quarterback at Maryland in 2014, and dig into some more advanced numbers, there were indications that he could be special. He forced 13 missed tackles on just 63 receptions and of his six drops that season, three came in just one game. Off-field concerns were what dropped Hill down boards in the 2016 NFL Draft, but his on-field ability was clear to see back at Oklahoma State in 2014. 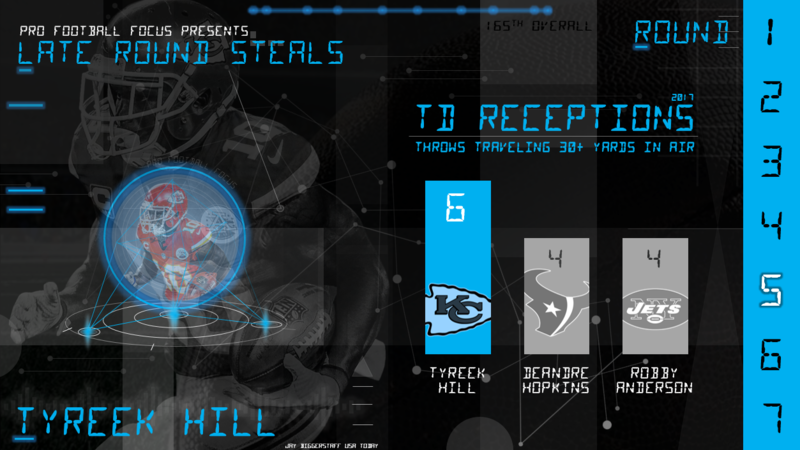 Hill forced 21 missed tackles on 101 carries, and another four on 31 receptions, all while scoring three touchdowns on kick and punt returns. He has taken him big play ability to the next level in the NFL and led the league with 628 yards on throws 20-plus yards downfield in 2017. Morgan is the definition of the type of player teams look to add late in the draft. Is he ever likely to set the fantasy football world alight? With 11 receptions in his first two seasons in the league, probably not, but what he does offer is that he is already one of the best blocking tight ends in the league, as he ranked third in run-blocking grade at the position with a PFF run-blocking grade of 83.1 in 2017. That’s true to the player he was in college, and while he had just three drops on 68 catchable passes in his final two seasons in college, it was his run-blocking where he was head and shoulders above the rest of the class in 2015. Jarrett was one of the darlings of our first season of grading college football, picking up 32 total pressures on just 275 pass-rushing snaps. Since arriving in the NFL his impact has continued to grow and he ranked 17th among defensive tackles in 2017 with a tackle resulting in a defensive stop on 9.5 percent of his snaps against the run. He has also seen his PFF grade improve, producing a grade of 79.0 as a rookie, 79.7 in his second year and seeing a huge step forward and grading at 87.1 this past season. A Penn State alum, Zettel took a big step forward in 2017 and racked up seven sacks, five hits and 31 hurries as he moved into a full-time role with the Lions. All of his sacks came in the first 10 games of the year, so the next step for Zettel to improve is to be able to put that together over a full season. What’s interesting with Zettel is that he moved from being an interior player in college to the edge with the Lions, but with 12 sacks, five hits and 49 hurries over the final two seasons of his college career, there were always hints that he could make an impact as a pass-rusher in the NFL. King was one of the top defensive backs in the country at Iowa, ranking fifth in the nation among draft-eligible players with a reception allowed just once every 20.5 snaps in coverage. He hit the ground running in the NFL and allowed just 46 receptions for over the course of his rookie season for just 424 yards. 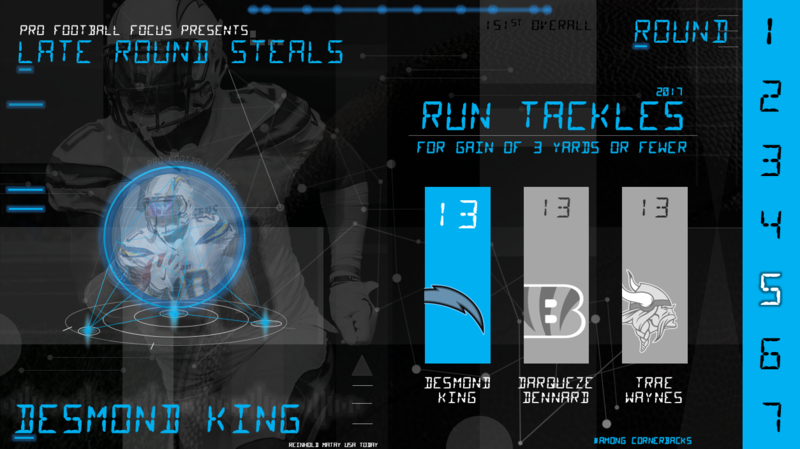 King impressed in run support too, registering a tackle resulting in a defensive stop on 5.9 percent of his run-defense snaps, ranked third among cornerbacks. Our second-highest graded safety in the NFL with a PFF grade of 92.0 in 2017, Amos has gone to strength to strength since being drafted by the Bears, with grades of 79.7 and 80.6, respectively, in his first two seasons in the league. Looking back at his final season at Penn State, Amos picked off three passes and broke up five more, so it shouldn’t come as too much of a shock that he has been able to make an impact in the NFL.